310 pages | 63 B/W Illus. This volume describes how well we maintain the knowledge we acquire throughout life. Research traditionally focuses on memory for events that are retained over short time periods that can be accommodated in experiments. This book, by contrast, uniquely describes the evolution of methods suitable for investigating memory of complex knowledge acquired over several years and retained during the entire life-span. The methods substitute statistical for experimental controls, and the investigations involve several hundred participants whose memory is tested up to 50 years after they acquired the knowledge in question. The book covers educational content, such as mathematics and foreign languages; knowledge acquired incidentally, such as the streets and buildings of the cities in which we live; and knowledge acquired through the media. Previously unpublished research on age-related access to knowledge is included. The analyses are based on the accessibility/availability ratio, a metric presented for the first time. This metric allows comparisons of the portion of available knowledge that can be recalled as a function of age, education and other individual differences, and as a function of the domain of knowledge in question. The ratio can be used to evaluate methods of instruction and methods of studying. It can also be used to evaluate memory development and to diagnose memory pathology. The volume will be of interest to researchers in human memory, developmental psychologists, gerontologists in academic and applied settings, and educators. 1. A Historical Perspective. 2. The Ohio Wesleyan Memory Research Program. 3. 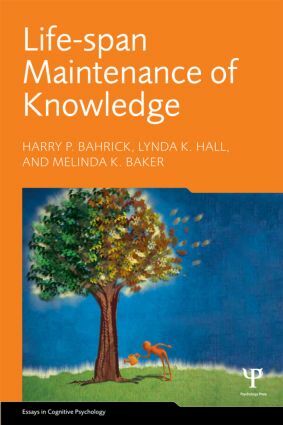 Acquisition and Maintenance of Knowledge. 4. Experimental and Quasi-Experimental Investigations of Overlearning. 5. Fluctuations of Access to Marginal Knowledge. 6. Initial Investigations of Age-related Access to Knowledge. 7. Larger Scale Investigations of Age-Related Access to Naturalistically Acquired Knowledge. 8. Distortions of Knowledge. 9. Summing Up. Association; Outstanding Alumnus Award, the Ohio State University Department of Psychology; and the Distinguished Professional Achievement Award, the Ohio State University Alumni Association. Lynda K. Hall received her Ph.D. in Developmental Psychology in 1986 from the University of Notre Dame. She was the Associate Director of Memory Research at Ohio Wesleyan University from 1985 to 1989, and she has been a member of the OWU faculty since 1989. She is currently a professor in and the chair of the Psychology Department. In addition, she was a recipient of the Sherman Dodge Shankland Award for the Encouragement of Teachers, Ohio Wesleyan University. Administrator for the Alta Golden Memory Center in San Diego, California.